Day 3 – Our day started with snow, but it didn’t stop us… we took a beautiful sunrise hike in Bryce Canyon and then drove through Grand Staircase – Escalante National Monument. The Grand Staircase includes miles of rock formations that have been developing for hundreds of millions of years and is like driving through another world! After an afternoon hike we got some awesome pizza from Escalante Outfitters in Escalante, Utah. We are early risers and got up for a sunrise hike. We were prepared for below zero temperatures, but were a bit surprised to open the door and see blowing snow! By the time we got to the trail most of the snow had stopped and Bryce Canyon was frosted with snow glistening in the sun… it was beautiful and very serene since few people were hiking. Our hike started at Sunrise Point and from there we went down in the canyon and hiked for about 2 hours. 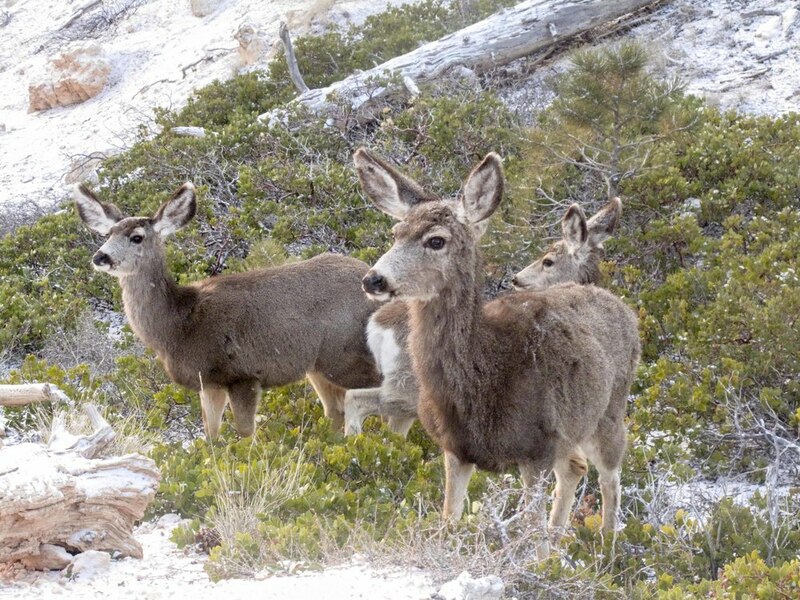 There is a lot of wildlife and we encountered a group of 5 deer who were friendly and let us get close enough to take some great pictures. After the hike we went to the Bryce Canyon General Store which is right by Sunrise Point. The General Store has a hot coffee and tea, a number of food selections, and offers a lot of picnic and toiletry supplies. We were really impressed with what was available both there and at the store at Ruby’s which is at the other Best Western hotel in Bryce City. Instead of going back into the Canyon, we decided to take a drive to the Grand Staircase – Escalante National Monument, which an area from Bryce Canyon to the east. Though it covers a larger space, the area we experienced was about 70 miles on Utah highway 12. It’s hard to describe the awe we had for this area… we didn’t know what to expect and found it to be a natural spectacle. There is a lot written about the area, but in a nutshell it’s hundreds of millions of years of rock formations layered on each other. The effect is huge rock formations of different colors and layers that seem other worldly… sort of like driving through the set of Star Wars or a Science Fiction movie! There are a number of hiking trails in the Grand Staircase area. Todd had heard of a beautiful one with a waterfall – Calf Creek Falls. We found the trail and went full steam ahead. Unfortunately, we didn’t follow our own advice which would be to check the map and guide to find out the length and difficulty before starting… about an hour in we realized it’s about 8 miles round trip and given the hike in the morning Daniel wasn’t up for it. We turned around and didn’t see the waterfall, but when we return it will be one of our first hikes! The town of Escalante is one of the biggest towns we had passed through all day and we stopped at the store to pick up some supplies and to ask where we could get a pizza. Escalante Outfitters was recommended – we’re happy we asked because we never would have thought that an awesome pizza place would be in an outdoor clothing shop! It was fantastic – we had pizza and salads – all handmade, fresh, great quality ingredients, etc. They also have breakfast, sandwiches, and a beer and wine list. This definitely the best food option in the entire area! 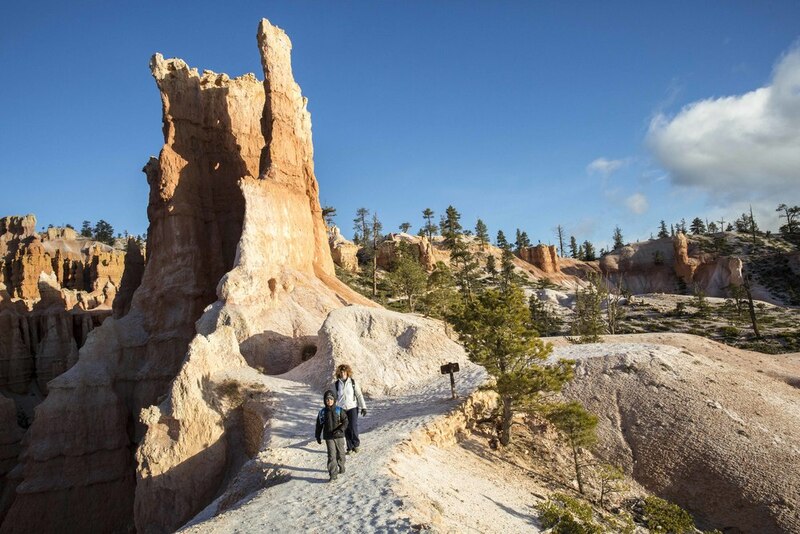 Sunrise point in Bryce Canyon National Park is a great starting point for a number of hikes in Bryce Canyon. Grand Staircase – Escalante National Monument is an awesome experience both hiking and by car. Check the trail guide before starting a hike to understand the length and difficulty level. 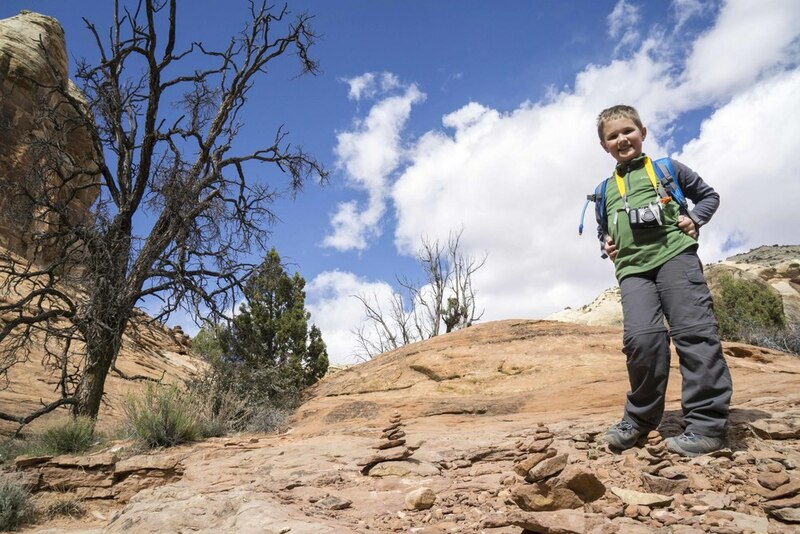 Escalante Outfitters in Escalante, Utah is our top food pick for the area.